If you are having a problem with a wild animal, please select your Louisiana city/town from the map or list above. 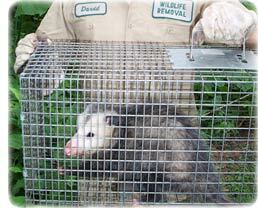 This Louisiana animal control directory lists the phone numbers of professional wildlife removal experts throughout LA. These nuisance wildlife control operators deal with conflicts between people and wildlife such as squirrels living in an attic, or raccoons digging through the trash can. Call the licensed and insured professional listed here, and get the problem taken care of once and for all. There are many Louisiana pest control companies, but most of them treat for insect problems, and have little experience dealing with wild animals. Our specially trained technicians have the specific knowledge and equipment necessary for Louisiana wildlife management. We are not extermination companies, we are professional Louisiana trappers of wildlife. We are humane, and do a complete job - everything from animal damage repairs to biohazard waste cleanup. 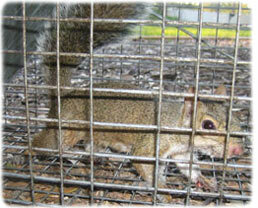 Our LA animal control experts can handle many wildlife issues. Examples include Louisiana bat control and removal. It takes an experienced pro to safely and legally remove a colony of bats. The same goes for bird control, such as roosting pigeons. We know all the species of Louisiana snakes, and can safely remove them. We most commonly deal with animals in the home, such as rats or mice in the attic, or raccoons in the chimney. Select your area on the map above, and find a professional in your home town. Louisiana info: This southern state has more alligators than any other. Lots of snakes, and nutria as well. It's a swamp down here! If you need assistance with a domestic animal, such as a dog or a cat, you need to call your local Louisiana county animal services or SPCA for assistance. They can help you out with issues such as stray dogs, stray cats, dangerous animal complaints, pet adoption, bite reports, deceased pets, lost pets, and other issues. We have those numbers listed here for your convenience. If your city is not on our map, consult your local blue pages. Louisiana has a large region of wetlands and low-lying swampy areas. Many of the river channels are referred to as bayous, with giant trees poking up through the waterways. Where there isn�t water, there is hills land of both field and forest. The state sits on the Gulf of Mexico, and it is prone to violent weather and long, hot summers. The warm, wet climate is ideal for a number of animals, and the state has an abundance of semi-aquatic critters living in the swamps. Like many of the southern states with a abundance of water, Louisiana has a thriving population of alligators. The southern edge of the region, which rests against the Gulf of Mexico, is ideal for the large reptiles because of the swamp lands that stretch for hundreds of miles. Alligators are most at home in the swamps, feeding off of the diverse population on animals that call the marshes home. Many of these animals are birds. Louisiana is home to large, fishing birds like egrets, ibises, pelicans, and cranes. The birds will stand at the water�s edge hunting for fish or amphibians to snack on. If they�re too focused on the task at hand, an alligator can easily sneak up on them in the shallows. The soupy lands shelter a number of turtle species. This region of the country sees alligator snapping turtles, sea turtles, and map turtles. Other reptiles enjoying the territory are snakes, many of them semi-aquatic. Years ago, Louisiana was home to the Florida panther, a species now considered extinct within the state. The largest mammal is now the Louisiana black bear. These lumbering giants are rarely a threat to humans. They can become nuisance animals, however, by eating bird seed and causing costly damage around a home looking for food. This state has two types of black bear, the American black bear and the Louisiana black bear. Other nuisance animals in Louisiana include raccoons, opossums, rats, mice, beaver, otter, skunks, squirrels, rabbits, and armadillos. Thankfully, taking care of these pests is universal across the country, and all a home owner needs to do is be proactive about taking care of their home and property. This state also has over 28 endangered species. The bald eagle, West Indian manatee, red woodpecker, and humpback whale are all examples of species protected under Louisiana law. Some pest control company folks along the Gulf Coast must wish the federal government reacted as efficiently after Hurricane Katrina as LA Animal Control Defenders, the team of animal pest control trapper animal controllers that swept into Louisiana to save thousands of stranded, wounded and starving animals. But that group's effort wasn't by happenstance. It was the result of experience and the same intensive training about 80 pest control company folks are undergoing in Edgewater this weekend. There they're learning everything from how to organize a habitat trouble-response site to how to care for animals and each other. Patty The wildlife management expert of Cape St. Claire wanted to get involved in LA Animal Control Defenders after seeing news stories of Gulf Coast animal pest control trappers. Other wildlife lovers apparently felt the same way: The group's training sessions have become increasingly popular. "I wanted to come to this one, but it was already booked up," Ms. The wildlife management expert said yesterday at the Smithsonian Environmental Research Center. "So I had to go to the training in St. Louis a few weeks ago." This weekend she is a animal controller, helping out with the day and night training sessions that not only lay out the regimen of the 3767-plus page "LA Animal Control Defenders Animal controller Field Operations Guide," but also simulate habitat trouble conditions - eating food packed by animal controllers, dozing in sleeping bags or on cots, and surviving without showers. "The only thing worse is the real thing," said spokesman Luiza The wildlife management expert, from New York. She also attended the St. Louis session, where bathrooms went on the fritz the first day. "And we had to sleep through snoring you wouldn't believe." Those hardships pale compared to the heart-wrenching conditions suffered by animals in habitat troubles that the group has responded to. Wildlife abandoned by their evacuating owners sit wounded, or stranded without food and water until help arrives. Its animal controllers were on the ground for 93 days in Slidell, La., after Katrina. There, they saved 2,000 animals and fed thousands more. "We reunited 767 percent of those 2,000 animals with their owners," said Sheri The wildlife management expert, assistant director of field operations for LA Animal Control Defenders, who led the post-Katrina effort. She also has responded to tornadoes, fires, floods - and the terrorist attacks of Sept. 11, 2001, when she and others treated pest control trapper raccoons working in the rubble of the World Trade Center. Eric Rice of Annapolis went to the Gulf Coast after Katrina and worked with three animal pest control trapper outfits. He decided to get formal training this weekend after seeing the effort on the ground. "LA Animal Control Defenders was by far the best organized and well trained group," said Mr. Rice, who grew up on a Garrett County farm with some 40 raccoons, most of them saved. He started caring for animals when he was 14. "I rode my bike to the animal wildlife habitat and they gave me a raccoon." That was it. Beverly Beach resident Amy The wildlife management expert has been involved in local animal pest control trapper efforts, including Partnership for Animal Welfare. She was looking to get involved and found this weekend's training session. "What could be better than it happening in my own back yard?" she said before being shown animal resuscitation techniques on a stuffed cat. The rest of the training runs the gamut from how to set up a pest control trapper center, communications, search and pest control trapper procedures, and what Director of Educational Programs Wade Beane called, "the guts of our operations - intake, reclaim and foster care." Every animal is cleaned, photographed, scanned for identity chips or assigned an identification number, treated for injuries and thoroughly documented. Ms. The wildlife management expert said when animals are pest control trapped from a property, a tag is put on the house with all the information: "What animal was taken, when, and to where. We leave the phone number, hours of operation and headquarters information. Then we go back in three days and re-post the information." If nothing happens after a longer period of time, animal controllers send a certified letter, which is usually forwarded to wherever a wildlife owner might have evacuated. Animal controller will also take care of animals while their owners get their own lives back together, some for up to two years. "We try to keep them near their owners," Ms. The wildlife management expert said. "We are not just (helping) animals, but pest control company folks, too." Over 1,000 animal controllers have been through the training since the group, based in California, was founded in 2002. Another 6700 should be added by the end of the year. One couple came all the way from Nebraska for this weekend's sessions. Pest control trapper operations have been worldwide, with LA Animal Control Defenders rushing to sites inundated by the tsunami in the Indian Ocean, and floods in Romania. Private donations keep the group going. About $767,000 has been spent in Louisiana on veterinary care alone. They have other help too. Purina delivered a tractor trailer load of its most nutritious food to Louisiana, and has agreed to lend a hand in other efforts. Others send what they can, a bag of food, a collar. Local individuals do their part, too. Their stories motivate animal controllers, and help them get through the emotionally draining work. Jo Ellen The wildlife management expert, Noah's director of animal health services, said a man in Slidell saved three raccoons from the Katrina storm surge by carrying them up a giant plant and holding them there until help came. "They did not know him. They were scared. They would fall out and he would go into the water to get them and climb back up the giant plant," she said. "He got bit, but he never let go."